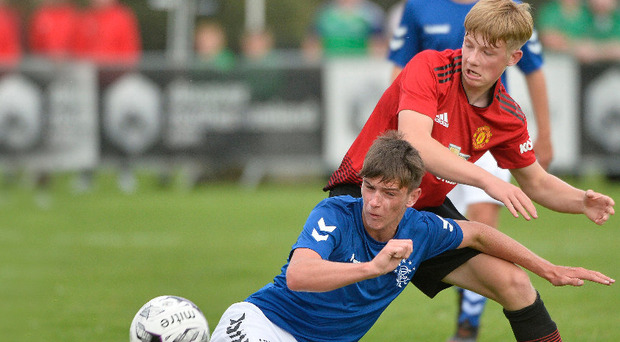 Just when it looked like Manchester United were set for an early exit, a George Walters goal kept the Red Devils' SuperCupNI dream alive. United bounced back from Monday's shock 2-1 defeat at the hands of County Londonderry by defeating Rangers 1-0 in front of the big crowd in the temporary stadium at the Ballymena Showgrounds. Walters' cool second-half finish settled the tie. United goalkeeper Joe Lawton made a fine save to maintain their lead, while Rangers star Reegan Aiken fired just past the post in stoppage time. Londonderry, who lit up the SuperCupNI on Monday night, were brought back down to earth with a bump at Anderson Park yesterday. They lost 2-0 to Club NI in Coleraine. Club NI are the Irish FA's Under 14 Academy side, who are a year younger than every other side in the Junior section. Ahead of today's final round of group fixtures, Club NI lead the way with four points while United and Londonderry have three each. The IFA side and United clash at Seahaven in Portstewart at 6pm in what is likely to be the decisive fixture. Glasgow Rangers' Cole McKibbon in action against Co Londonderry's Lee Harkin at the 2018 SuperCupNI. While Manchester United have struggled, fellow Premier League club Southampton have impressed. They are now one of the favourites to win this year's Junior title, with two wins from their opening two games. The Saints top Group E after a 3-1 win over American club Strikers with goals from Cameron Salmon, Goran Babic and Leigh Kavanagh settling the tie. The Americans had a player sent off. The club's academy manager Matt Hale believes the tournament's competitive nature brings the Premier League club back to Coleraine each summer. "We love the variation in the style of play that you get at the Super Cup. You do get teams who play possession football, but you also get sides that play direct football. You get the opportunity to play both physical teams and technical teams at this competition," he said. "This tournament also gives kids a good appreciation of three points. In England, we no longer play in leagues until the boys are at Under 18 level. We just play friendlies because the focus is on development rather than points. "But I think it's important for young players to understand the importance of winning and the value of three points, and you certainly get that at this tournament where you really need to win every game to win the tournament. "And everyone is so welcoming as well. There was a huge crowd at the parade and in the Showgrounds for the opening ceremony, which is really unique to this tournament. The staff at the grounds and The Lodge hotel are fantastic. There's a friendly feel to this tournament, which sets it apart from other youth competitions." County Antrim remain undefeated in Group C following a comfortable 3-0 win over County Fermanagh in Broughshane. Liam Carr, Sean Paul McAllister and Dale Taylor scored the goals. Antrim are tied on four points with Plymouth Argyle, with the two clubs set to clash in Broughshane at noon today. The English side defeated Mexican club Chivas 1-0 yesterday. County Down are still in with a chance of winning Group B despite a disappointing 0-0 draw with Cherry Orchard at Parker Avenue. Gary McAllister's side and Cherry Orchard both sit on four points, with one game to go. Elsewhere in the group, Charlton Athletic bounced back from Monday's defeat to Down with a 4-3 win over American side Global Premier Soccer in Ballymoney. County Armagh moved on to four points thanks to a 1-1 draw with Dundalk Schools in Castlerock. Also in Group E, Chilean side Colina caused a major upset at Scroggy Road, Limavady, defeating Leeds United 2-1. It was the first win for the Chilean side, who have been regulars at the north coast over the last decade. By Robert Jones Two of the biggest clubs in Europe will make their debuts at this summer's STATSports SuperCupNI with Arsenal and Valencia CF signing up for the international youth tournament. 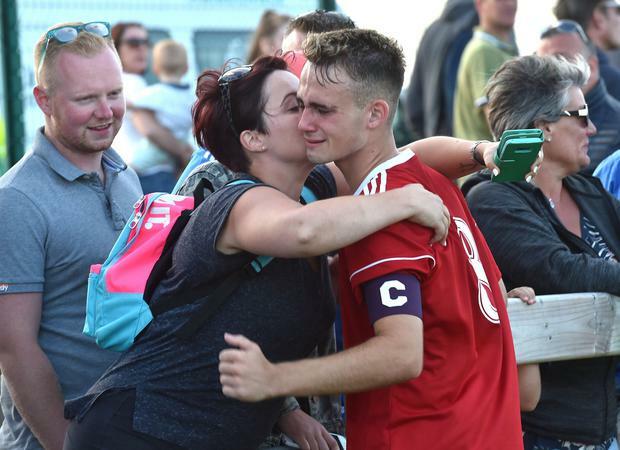 By Robert Jones Celtic and Rangers have both signed up for the STATSports SuperCupNI - but Glasgow's Old Firm will not meet in this summer's international youth tournament.